Christmas is a time of traditions, especially when it comes to what foods to celebrate with. When it comes to Christmas desserts, many of you may think of boiled puddings with brandy soaked dried fruits, accompanied by home made custard and happy times spent celebrating with family, unwrapping presents or singing carols. In this post a week before Christmas I will try to inspire you to stray from a traditional cake with a round up of festive alternative sweets with which to celebrate from the blog archives. These desserts might suit a summer style Christmas where there is no snow and the day might be spent with friends and family at home, by the seaside, at the local park or in the backyard, watching the children playing with their new cricket set as the dog chases the ball. One requires no baking (the Zuccotto), another is gluten free (the flourless orange) and one isn’t a cake at all but a refreshing boozy jelly made with strawberries and Prosecco. Go on – I dare you to try something different this Christmas! (1) Crostoli – mamma is very proud of her crostoli. 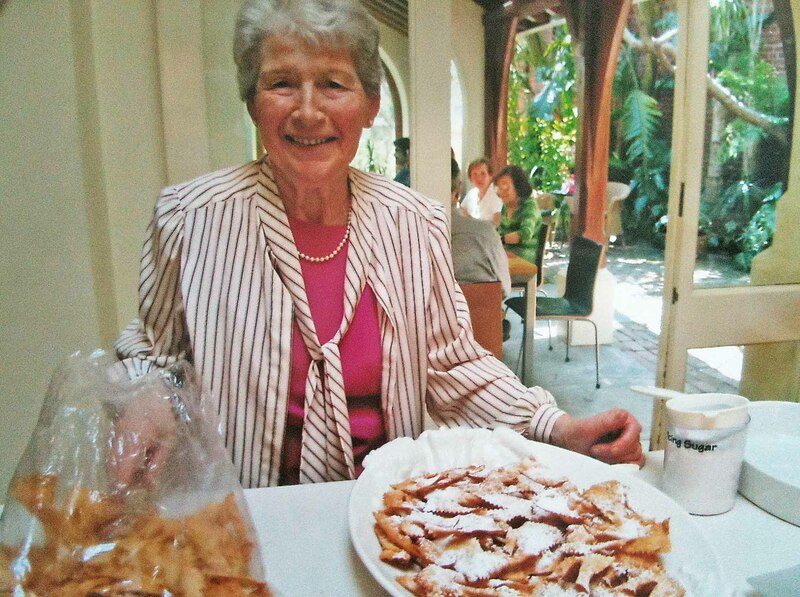 She used to make huge quantities for family celebrations (the photo below is from her 80th birthday a few years back). You will need a pasta rolling machine to get the pastry thin (unless you want to roll it by hand). if you have only ever eaten store bought crostoli, you will love these – they are crispy and only slightly sweet. They are also known as angel’s wings. The link is here. (3) Strawberry and Prosecco jelly – if it is predicted to be a very hot Christmas day (assuming you are in the Southern Hemisphere), then why not try some strawberry and Prosecco jelly? 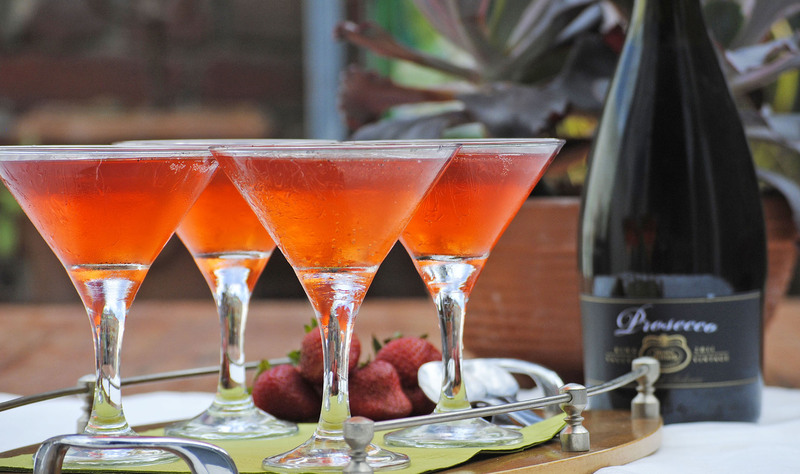 The strawberries are soaked in Prosecco for several hours and then discarded (well – don’t discard them as they are FANTASTIC to eat) and then a jelly is made with the liquid and served in martini glasses. This one takes a bit of time to prepare but is well worth the effort. The link is here. (4) Italian baked ricotta cheesecake – an impressive looking cake just made for a celebration. It has a thin biscuit-like base with a baked ricotta and cream cheese filling. Any type of berry makes a lovely topping to this festive delight. The link is here. (5) Flourless orange cake – if you have gluten intolerant guests, this is a delicious cake to have up your sleeve. It contains whole oranges which are boiled then blended in this almond meal based cake. It remains moist for several days after baking. You could make this one well in advance and serve it with some creme fraiche on the side. This is the recipe that got me through the first of my Masterchef (series 4) auditions in 2011. The link is here. Ok so now you have Christmas dessert sorted! What a lovely collection of treats. Seeing the Crostoli made me smile. When I was kid back in the fifties my grandmother used to bring over the Crostoli she had made. She packed then in between layers of waxed paper and put them in a long box from Saks Fifth Avenue. She brought those treats to us, and we gobbled them up! Buone feste a te e la tua famiglia! I love zuccotto but always remember a few Christmases ago when I made quite a large one and two friends and I ate the whole thing in one sitting. I will never think of them the same way. Buon natale to you! Thank you for these ideas. I have another big day on Boxing Day and needed some help for desserts. Your flourless orange cake is just perfect. Buon Natale and thank you for a most wonderful blog.